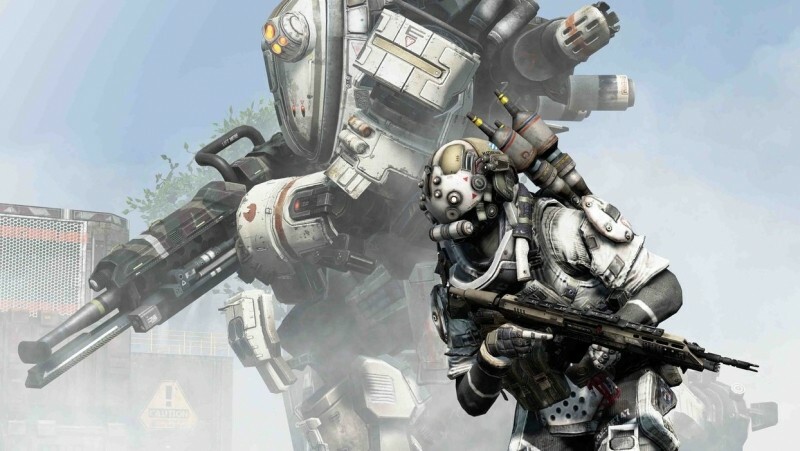 The internet is abuzz with Titanfall as the embargo lifts on preview events, flooding the infoverse with fresh takes on Respawn's upcoming Xbox and PC mech shooter. We couldn't make the event, so instead we've rounded-up the best new looks our colleagues in the gaming press have to offer. The assembled gaming press is painting a rather pretty picture of the first major current-gen exclusive online multiplayer exclusive shooter. The controls are spot-on. The visuals are striking. The action, while a bit sluggish when all the big robots come out to play, is quite satisfying. They're cranking the hype engine, already overloaded from news of the upcoming beta test, into overdrive. The assembled journalist were invited to play three game modes — Attrition (Team Deathmatch with fodder), Hard Points (a meter-filling Conquest mode) and Last Titan Standing, which is exactly what it sounds like. Along with the previously seen Angel City map, they also played on a new map called Fracture, a remote colony planet dotted with small buildings and rocky outcroppings. Some played on PC. Some played on Xbox One. It doesn't look like anyone was playing on the Xbox 360. You'll see those in the video previews in a moment. First, let me share with you a snippet of a preview from PC World's Hayden Dingman, who calls the game "surprisingly deep" and then goes on to prove it, describing an encounter with an enemy pilot in delightful detail. I sprint past the enemy, now locked in a duel for the ages. I take special care not to die beneath its enormous feet—a particularly egregious death both in terms of physical pain and embarrassment. Once past, I turn and sprint toward—yes, toward—the enemy Titan, leaping onto its back. They call it "rodeoing." I call it terrifying. I rip open one of the Titan's access panels. Inside is a bundle of wires that look vaguely important. I aim my gun at the Titan's innards and pull the trigger. The Titan is doomed, and the enemy pilot knows it. He mashes the eject button, and the top portion of the once-mighty machine erupts, catapulting us both into the sky alongside with it. To add injury to insult, I shoot and kill the pilot while we're temporarily weightless, a quarter-mile above the surface. It's descriptions like these that get me excited, much more than any video clips or conveniently-angled screenshots. If you can make a game journalist put aside the notes and feature lists to tell a story, you're onto something special. But enough flowery robot combat romance novel prose. You came here to watch things explode, and there's plenty of that coming out of the preview event. GameSpot's video preview, titled "More Than Just Call of Duty With Mechs", does a spectacular job of showing off some of the nifty things pilots can do when not encased in tons of heavy metal. Makes me want to play just to hop around like a deranged rabbit, dodging cannon fire. The fine folks at VG24/7 supplemented their preview coverage with a series of videos comparing Titanfall on Xbox One to Titanfall on PC. The verdict? I can't really tell the difference. Maybe you can. Eurogamer's Thomas Morgan's thoughts on Titanfall are neatly summarized in this gameplay video, narrated by a disappointed Ian Higton. Morgan seems optimistic for Respawn's first outing, praising the controls and overall art direction, but fretting over sluggish Titan-on-Titan battles. The most impressive footage out of the event comes from Eurogamer as well, where their 60 frames-per-second capable video player demonstrates just how silky-smooth Titanfall runs on the Xbox One. They've also got both videos available for download, so you can watch them at their native resolution. Speaking of resolution, Digital Foundry at Eurogamer calculated the preview build to be running at 1408x792 resolution, or 792p, and not 1080p on the Xbox One. Respawn has confirmed that calculation, indicating the game is due for a resolution increase before release. The boys at VideoGamer posted this lengthy gameplay walkthough alongside their preview article, calling Titanfall "The Call of Duty Game You've Been Waiting For." Is that enough for you to read and watch? If not, there's plenty more where that came from. Here, I'll even give you a Google search to get you started. As you wander off to dream of giant mechs, I leave you with the closing words of The Guardian's Keith Stuart, who neatly summarizes how most of the gaming press seems to feel about Titanfall leading up to its release for PC and Xbox One in March. It's fun. That's the thing. It's chaotic, it is loud, it batters your senses with alarm systems and dialogue and explosions, but it is fun. And it flows. I felt it straightaway. The same feeling as Quake Arena, the same as Team Fortress. There is a lot of discover, and who knows how the game will hold up on public servers against hundreds of super-talented gamers. But once you've jumped in a titan and fired off four spiraling missiles at another giant mech across a neon-lit sci-fi city, you don't want to get out.